Proprietary Name: Tetracaine Hydrochloride What is the Proprietary Name? Non-Proprietary Name: Tetracaine Hydrochloride What is the Non-Proprietary Name? 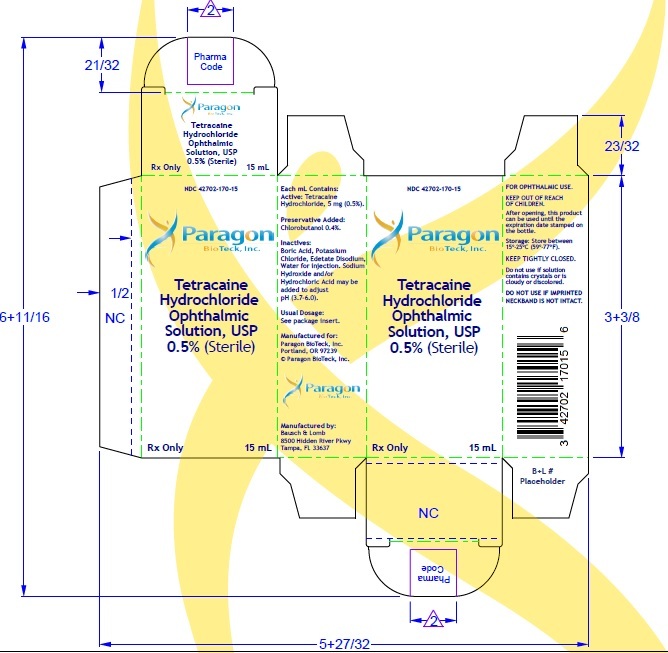 42702 - Paragon Bioteck, Inc.
Tetracaine Hydrochloride with NDC 42702-170 is a a human prescription drug product labeled by Paragon Bioteck, Inc.. The generic name of Tetracaine Hydrochloride is tetracaine hydrochloride. The product's dosage form is solution/ drops and is administered via ophthalmic form. Labeler Name: Paragon Bioteck, Inc.
FDA Application Number: NDA210821 What is the FDA Application Number? Tetracaine Hydrochloride Ophthalmic Solution USP, 0.5% is indicated for procedures requiringa rapid and short-acting topical ophthalmic anesthetic. One drop topically in the eye(s) as needed. Tetracaine Hydrochloride Ophthalmic Solution USP, 0.5% is a clear, colorless, ophthalmicsolution containing 0.5% w/v tetracaine hydrochloride equivalent to tetracaine 0.44% w/v. Tetracaine Hydrochloride Ophthalmic Solution, USP, 0.5% should not be used in patients with ahistory of hypersensitivity to any component of this preparation. Not for injection or intraocular use. Do not use intracamerally because use of TetracaineHydrochloride Ophthalmic Solution USP, 0.5% may lead to damage of the corneal endothelialcells. Prolonged use or abuse may lead to corneal epithelial toxicity and may manifest as epithelialdefects which may progress to permanent corneal damage. Patients should not touch the eye for at least 10-20 minutes after using anesthetic as accidentalinjuries can occur due to insensitivity of the eye. The following serious ocular adverse reactions are described elsewhere in the labeling: •Corneal Injury with Intracameral Use [See Warnings and Precautions (5.1)] •Corneal Toxicity [See Warnings and Precautions (5.2)] •Corneal Injury due to Insensitivity [See Warnings and Precautions (5.3)]The following adverse reactions have been identified following use of Tetracaine Hydrochloride Ophthalmic Solution USP, 0.5%. Because these reactions are reported voluntarily from a population of uncertain size, it is not always possible to reliable estimate their frequency or establish a causal relationship to drug exposure.Ocular Adverse ReactionsTransient stinging, burning, and conjunctival redness, eye irritation, eye pain, ocular discomfort. Risk SummaryThere are no adequate and well-controlled studies with Tetracaine Hydrochloride OphthalmicSolution USP, 0.5% in pregnant women. Animal developmental and reproductive toxicity studieswith tetracaine hydrochloride have not been reported in the published literature. Risk SummaryThere are no data to assess whether Tetracaine Hydrochloride Ophthalmic Solution USP, 0.5% isexcreted in human milk or to assess its effects on milk production/excretion. The developmentaland health benefits of breastfeeding should be considered along with the mother’s clinical needfor Tetracaine Hydrochloride Ophthalmic Solution USP, 0.5% and any potential adverse effectson the breastfed child from Tetracaine Hydrochloride Ophthalmic Solution USP, 0.5%. No human data on the effect of Tetracaine Hydrochloride Ophthalmic Solution USP, 0.5% onfertility are available. Safety of Tetracaine Hydrochloride Ophthalmic Solution USP, 0.5% in the pediatric populationhas been demonstrated in clinical trials. Efficacy of Tetracaine Hydrochloride OphthalmicSolution USP, 0.5% for use in pediatric patients has been extrapolated from adequate and wellcontrolled clinical trials in the adult population. No overall differences in safety or effectiveness of Tetracaine Hydrochloride OphthalmicSolution USP, 0.5% have been observed between elderly and younger patients. Prolonged use of a topical ocular anesthetic including Tetracaine Hydrochloride OphthalmicSolution USP, 0.5% may produce permanent corneal opacification and ulceration withaccompanying visual loss. Tetracaine blocks sodium ion channels required for the initiation and conduction of neuronalimpulses thereby affecting local anesthesia. The systemic exposure to tetracaine following topical ocular administration of TetracaineHydrochloride Ophthalmic Solution USP, 0.5% has not been studied. Tetracaine hydrochloride ismetabolized by plasma pseudocholinesterases and nonspecific esterases in ocular tissues. Studies to assess the genotoxicity of tetracaine hydrochloride have not been reported in thepublished literature. Long-term animal studies have not been conducted to evaluate thecarcinogenic potential of tetracaine hydrochloride. Animal studies to assess the effects oftetracaine hydrochloride on fertility have not been reported in the published literature. Topical administration of Tetracaine Hydrochloride Ophthalmic Solution USP, 0.5% results inlocalized temporary anesthesia. The maximum effect is achieved within 10–20 seconds afterinstillation, with efficacy lasting 10–20 minutes. Duration of effect can be extended withrepeated dosing. [See Warnings and Precautions (5.2) and Overdosage (10)]. Tetracaine Hydrochloride Ophthalmic Solution USP, 0.5% is supplied as a sterile, aqueous,topical ophthalmic solution with a fill volume of 15 mL in a 15 mL low-density polyethyleneplastic dropper bottle with a low-density polyethylene dropper tip and white polypropylene cap.NDC 42702-170-15After opening, this product can be used until the expiration date stamped on the bottle.Storage: Store at 15°C to 25°C (59°F to 77°F). Protect from light. Do not use if solutioncontains crystals, cloudy, or discolored.